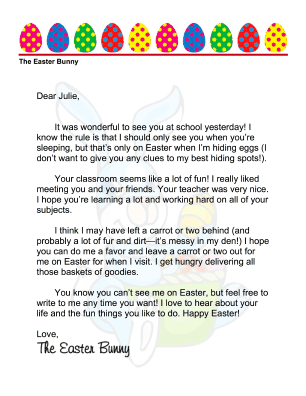 This free, printable letter from the Easter Bunny is intended for children and students who had the Easter Bunny visit their classroom or school. It was wonderful to see you at school yesterday! I know the rule is that I should only see you when you're sleeping, but that's only on Easter when I'm hiding eggs (I don't want to give you any clues to my best hiding spots!). Your classroom seems like a lot of fun! I really liked meeting you and your friends. Your teacher was very nice. I hope you're learning a lot and working hard on all of your subjects. I think I may have left a carrot or two behind (and probably a lot of fur and dirt-it's messy in my den!) 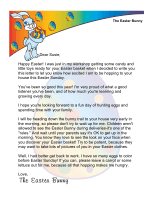 I hope you can do me a favor and leave a carrot or two out for me on Easter for when I visit. I get hungry delivering all those baskets of goodies. 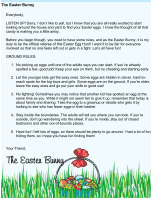 You know you can't see me on Easter, but feel free to write to me any time you want! I love to hear about your life and the fun things you like to do. Happy Easter!